The Prairie Guest House sits on a farm-like setting of two acres in Hamilton County. Innkeepers Karen & John Newton welcome you to the spacious inn which features beautiful gardens, large native Indiana trees, and a rustic barn. The Prairie Guest House is the perfect place for meetings, retreats, romantic getaways and small, private dinners. Whether you are seeking casual or formal, large or small, we can accommodate your gathering. Our beautifully appointed dining room and sun room can comfortably seat up to 40 people for an evening, lunch, or brunch meal. It features the original LS Ayres Board Room table and boasts a cozy fireplace. The Meadow is a lovely spot for your ceremony and reception of up to 120 guests. 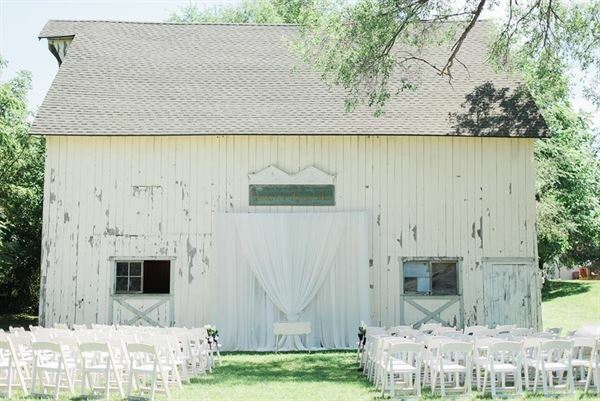 Set against the back drop of our rustic 19th century barn and covered by a canopy of black walnut trees, you’ll feel as though you’re miles away from civilization while enjoying the convenience of a centralized location for your guests, regardless of where they’re travelling from! Ceremony and Reception includes: - Barn Meadow for wedding ceremony and reception o 2 hours for rehearsal on Friday o All day Saturday (the reception must end by 10:30 p.m. per city ordinance) - Wooden Archway for Ceremony with Vintage White Pedestals for floral arrangements - Charming vintage tables and dressers for cake table, guest book and gift table - Lighted Tent for Reception - Dance Floor - Seating for up to 120; Tables, white padded chairs & standard single-color linen tablecloths. (Chairs are used for ceremony and moved for reception seating) - Banquet tables for buffet, DJ and bar, as needed ? Two indoor bathrooms (in Main House and in Yoga Studio) - Bridal and Attendants Changing Room/Waiting Area From 1:00 p.m. until close of reception on Saturday - Shuttle service to remote lot for event guests For the Bridal Party: - Refreshment cooler of sodas and bottled waters for bridal party during pictures - Wedding Day Survival Sustenance! Afternoon snack of fruit, cheese and crackers for the hardworking bridal party Special pricing available for smaller groups please inquire. Art Sanctuary Of Indiana is very beautiful and ideal place located in Martinsville city in Indiana. The Mission of Art Sanctuary is to educate, encourage, and stimulate interest in the fine arts and crafts for all ages in Morgan and surrounding counties, including the under served and diverse populations. The venue operate an art gallery where from time to time various shows are presented. And also provide resident artists studios where artists work in their chosen art field, sell their art, and give various kinds of art classes. And for function and event venue offer banquet and reception hall rentals. Available for rent are two major areas - the Main Gallery and the Lower Gallery. The Main Gallery is more formal and perfect for weddings, wedding receptions, meetings, social functions, family reunions, etc. The Lower Gallery is more casual and has a complete kitchen, stage, and a very large meeting/dining area available. The Art Sanctuary has tables and chairs available for use with any event rental.